The political news environment has changed dramatically in recent years. Long gone are the days when political information was confined to a few network news channels and major national newspapers or magazines. Today, newspapers and network TV compete with 24-hour cable channels and a host of online news services—from online efforts by traditional publishers to user-generated content on blogs, personal webpages, social networking sites and elsewhere. Political news junkies can customize their news using RSS feeds or news aggregators, get updates on the topics they are specifically interested in at any time of day and in multiple formats, and then contribute their own thoughts to the discussion on their personal blog or Twitter feed. These changes inspire a host of questions. In a world of dispersed media, where are politically engaged citizens going for their news? How do alternative outlets such as blogs fit into the overall media environment? How are mobile devices used for gathering political information, particularly with respect to the consumption of traditional media content? And as voters move down the long tail of media content, are they able to more narrowly focus in on content that fits their existing political philosophy? We address these and other issues in the section that follows. The online political news audience has grown dramatically over the past two presidential election cycles. The proportion of Americans going online for election-related news and information has more than doubled since the end of the 2000 race. 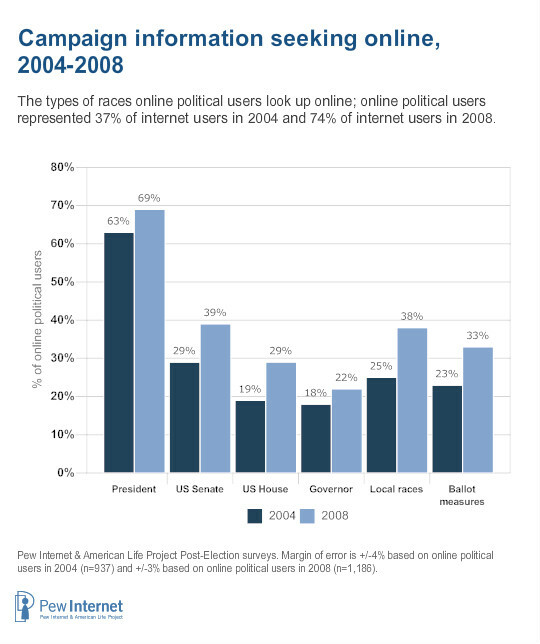 Six in ten internet users went online in 2008 for campaign news, up from 52% at a similar point in 2004 and 33% in 2000. 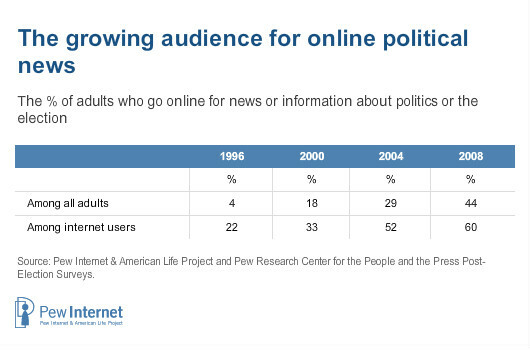 Moreover, because the total population of internet users has also grown over that time, the overall size of the online political news consumer audience has grown from 18% of all adults in 2000 to 44% of all adults today. 21% did so less often. Young adults and those with relatively high levels of income and education are generally more inclined to go online for political and election-related news, largely because these groups are most likely to go online in the first place. At the same time, it is also clear that a diverse range of internet users go online for political content at least occasionally. For example, while seniors and those without a college education are generally less intense internet users relative to those who are younger or have higher levels of education, one-third (32%) of online seniors and nearly half (45%) of internet users with a high school education or less went online in 2008 for campaign news. 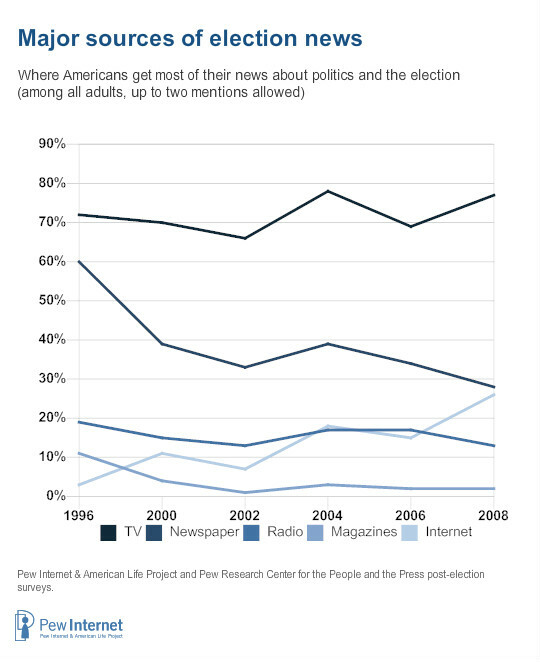 The internet now greatly outpaces radio and rivals newspapers as a source of election news among the population as a whole. For the first time since the Pew Internet Project began surveying Americans’ news consumption habits, the internet now clearly exceeds radio, and is on par with newspapers, as a major source of campaign and election news among the entire adult population (including internet users and non-users). Fully 26% of all adults now get most of their election news from the internet, nearly equal to the 28% who cite newspapers and double the 13% who listen to the radio. Television remains the most common source of election news, as 77% of Americans turn to election-related television programming for their campaign information (respondents were allowed to provide up to two sources of campaign news when answering this question). Since November 2000, the percentage of Americans relying on the internet as a major source of election news has more than doubled (from 11% to 26%) while the proportion relying on newspapers has fallen from 39% to 28% today. 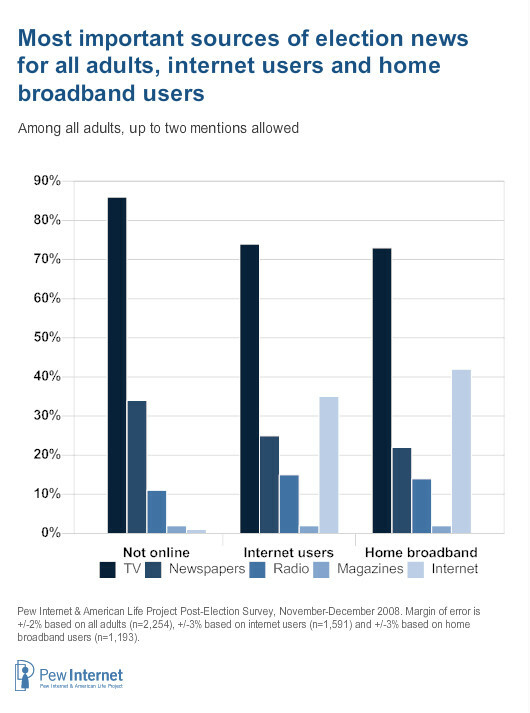 The influence of the internet on news consumption habits is especially apparent when looking at internet users in general and those with a home broadband connection specifically.6 Within the broadband population, the internet is by far the second-most important source of campaign news, behind only television and well ahead of newspapers, radio and magazines. Those with college degrees or high levels of income (who also have high levels of broadband adoption) are also likely to cite the internet as a major source of election news. For example, 41% of college graduates and 33% of those with some college experience cite the internet as a major source of campaign news, compared with 18% of high school graduates and just 3% of those without a high school degree. 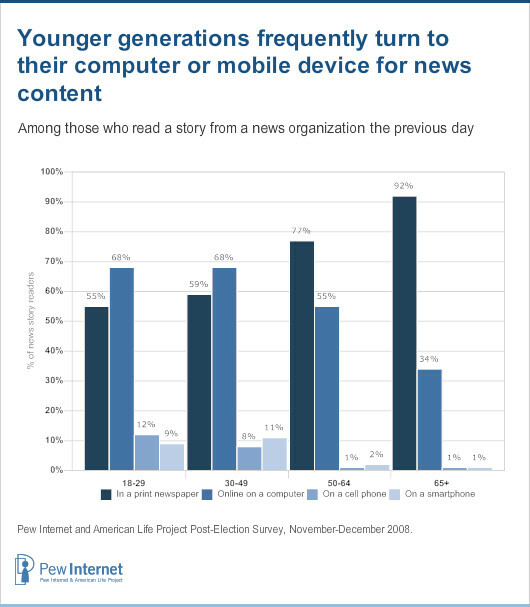 In a similar vein, young adults continue to move away from television and newspapers and towards the internet as their primary source for a wide range of content—and election news is no different. Indeed, this is true even for a wider swath of the population. Among all Americans (internet users and non-users alike) under the age of 50, the internet well outpaces newspapers as a major source of election news. One-third (34%) of all adults in this age cohort cite the internet as a major source of campaign news, compared with just one in five who use newspapers. Similarly, while 83% of 50-64 year olds and 89% of those 65 and older get most of their election news from television, this falls to 74% for 30-49 year olds and just 67% for those under the age of 30. 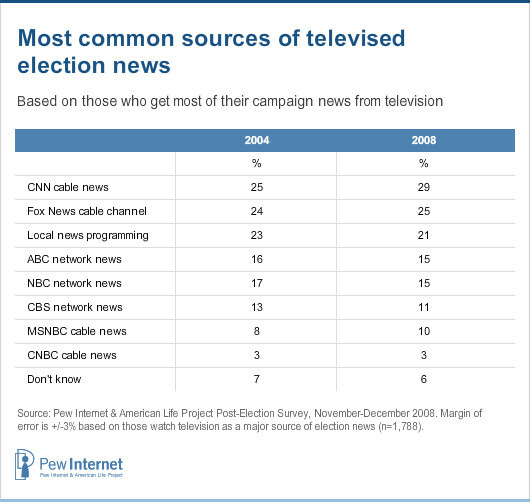 Within the 77% of the population that gets much of its campaign news from television, the most common sources of programming remained stable between 2004 and 2008. As in 2004 CNN, Fox News and local news programming are the three primary sources that political news viewers turn to for election coverage. Significant numbers now read newspapers and watch newscasts on their computer or mobile device. In light of the growing use of the internet and concurrent decline in the importance of newspapers discussed above, it is worth pointing out that newspapers (as well as video newscasts) can now be consumed in a number of formats—on paper, online on a computer, or on a cell phone or other mobile device. In order to capture some of these nuances, we asked a series of questions about the formats in which Americans consume news from traditional television and print media sources. 6% of cell phone owners read a news story on a cell phone, and 7% did so using a Blackberry, iPhone or other smartphone. Put another way, more than half of those who read a story from a news organization on a typical day during the post-election period did so online on a computer or on a mobile device. This comes to 27% of all Americans (news readers and non-readers, internet users and non-users alike) who read digital content from a newspaper organization on a typical day. In contrast to print news stories, video newscasts are still far more likely to be viewed on an actual television than on a computer or mobile device. Among the two-thirds of adults who watch a video newscast on a typical day, fully 97% do so on their television. By contrast, 28% of news-watching internet users watched a news story online on a computer. At the moment very few Americans are reaching for their cell phone or mobile device for video news, particularly compared with print news: Among cell phone owners who watched a video newscast the previous day, just 2% watched on a smartphone and just 1% did so on a cell phone. In addition to relying more heavily on the internet as a source of election news, younger Americans stand out with respect to the devices they use to consume their news. In general, adults in different age groups are similarly likely to read a story from a newspaper organization on a typical day: 45% of 18-29 year olds, 51% 30-49 year olds, 57% of 50-64 year olds and 53% of those 65 and older do this. However, among this population of news consumers, those under age 50 are far more likely to eschew traditional print media and obtain their news online or using a mobile device. While most age groups consume print news in relatively equal quantity, older adults (those age 50 and up) are far more reliant than are younger Americans on video news, and are much more likely than younger adults to watch a video news story in any format on a typical day. Seven in ten of those age 50-64 (71%) and three-quarters (75%) of those age 65 and up watch a news story or video newscast in any format on a typical day—these are both significantly greater than the 63% of 30-49 year olds and the 59% of 18-29 year olds who do this. Among this cohort who watches a newscast on a typical day, the age group that is most likely to do so online is 30-49 year olds. More than one-third of online 30-49 year olds (35%) who watch a video newscast on a typical day do so online a computer, compared with one-quarter (25%) of 18-29 year olds, 22% of 50-64 year olds and 18% of those age 65 and older. In other words, while young adults (those age 18-29) are voracious consumers of certain types of video content (see Part 1) they do not necessarily sit down to watch traditional video news stories in any location—whether online on their computer or on the television in their living room. Online political users delved deeply into the long tail of political commentary in 2008. 64% got news or information about the November elections from network TV websites such as cnn.com, abcnews.com or msnbcnews.com. Despite their relative lack of interest in video news, younger online political users flock to the online presences of mainstream video news outlets: 72% of 18-29 year olds, 69% of 30-49 year olds, 52% of those age 50-64 and 38% of online political users age 65 and up visit these sites for political news and information. Obama voters also make great use of these sites: 70% of Obama-supporting online political users do so, compared with 56% of McCain voters. 54% visited portal news services like Google news or Yahoo news. 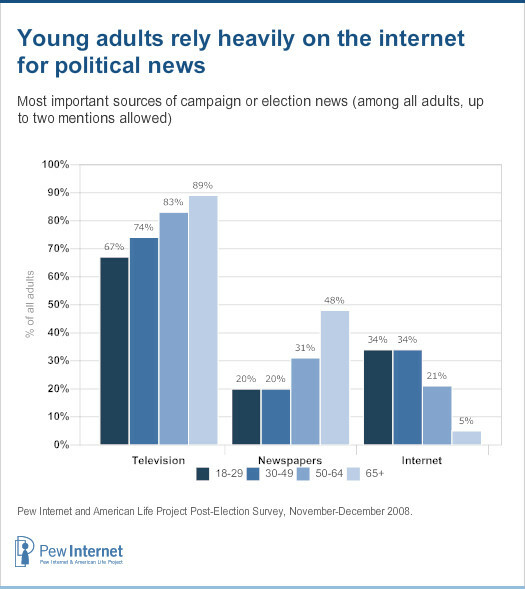 Two-thirds (66%) of online political users under the age of 30 visit these sites for election news, as do 71% of Twitter users and 58% of Obama supporters. Mobile internet users also rely heavily on these sites. 43% visited the websites of local news organizations. 40% read someone else’s commentary on the campaign on an online news group, website or blog, led by those under the age of 30 and social media aficionados. 34% visited the websites of major national newspapers such as USA Today, the New York Times or the Wall Street Journal. Men, college graduates and wireless internet users are especially interested in this type of news. 26% visited blogs that cover news, politics or the media. Democrats and users of other social media tools such as Twitter and social networking sites are particularly fond of reading blogs. 24% each visited issue-oriented websites; the website of a state or local government; or the website of an international news organization, such as the BBC. 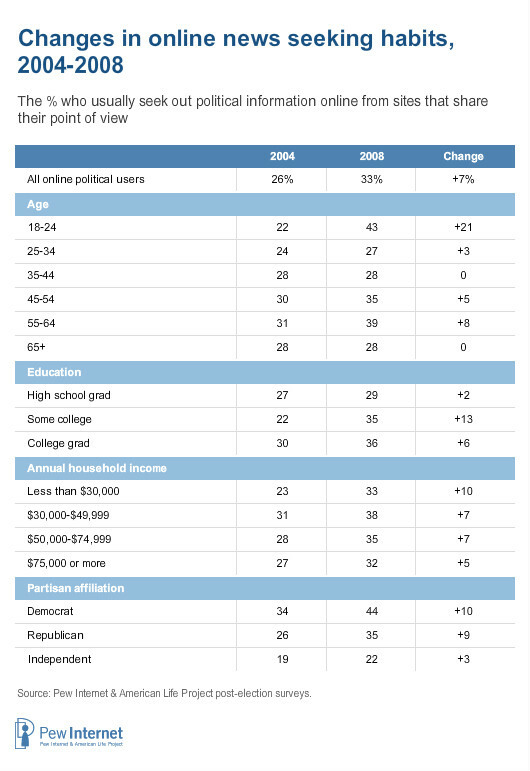 Online political users under the age of 30, college graduates, Obama voters and political independents frequently go online for an international perspective on the political news of the day. 21% each visited the website of a radio news organization like npr.org; or a fact-checking site such as snopes.com, factcheck.org or polifact.com. Democratic voters and political independents are especially likely to go online to visit the website of a radio organization. 19% visited news satire websites like The Onion or the Daily Show. 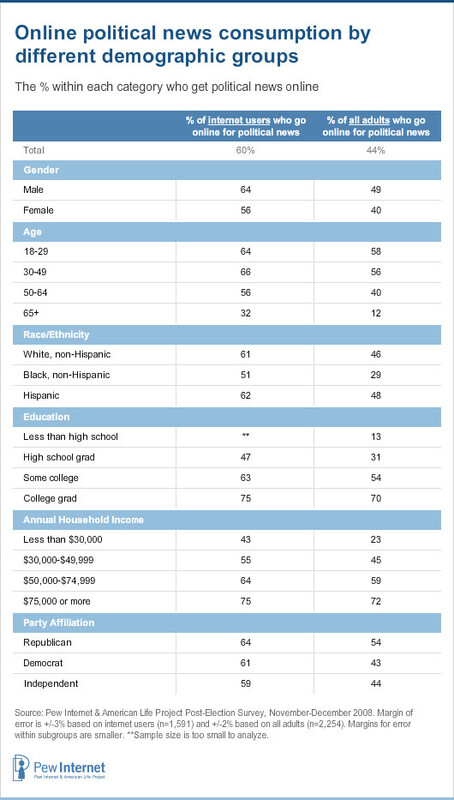 More than one-quarter (27%) of online political users under the age of 30 visit these sites, although one in five 30-49 year olds (21%) do so as well. Republicans, on the other hand, stay away from these sites in droves—just one in ten Republican online political users visit news satire websites, compared with 26% of Democrats and 21% of independents. 12% visited the website of an alternative news organization such as alternet.org or newsmax.com. Men are twice as likely to visit these sites as women: 16% of male online political users has done so, compared with just 8% of women. Put another way, 87% of political news consumers sought out multiple genres of online news over the course of the election. 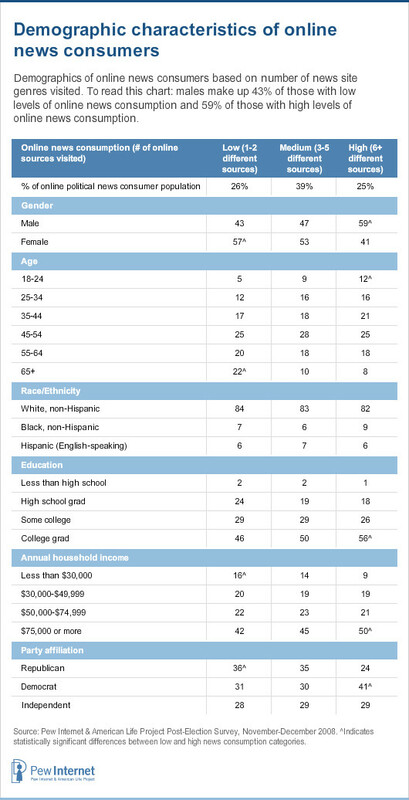 Men, young adults, those who are affiliated with the Democratic party and those with high levels of income and education tend to be the most intense online news consumers. In addition to ranging far and wide for political content online, the most intense online news consumers also rely on a host of social media tools to help them find, comment on and share the news that they find online. Online political users who visit a wide range of different sources for political news are significantly more likely to: post their own political content online, use online social networking sites for political purposes, watch online political videos, customize their political news using RSS feeds and other tools, and share the information they find online with others. 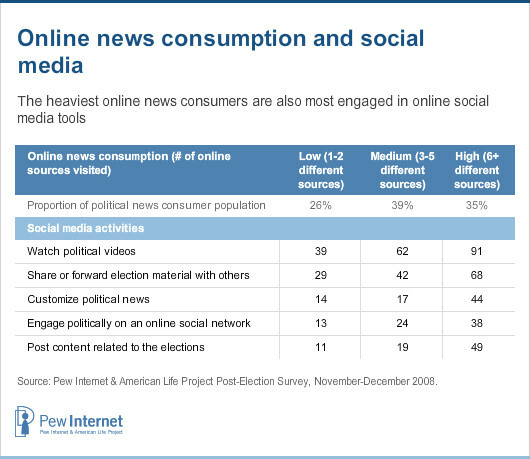 Online news consumers are increasingly seeking out news sites with a partisan slant. 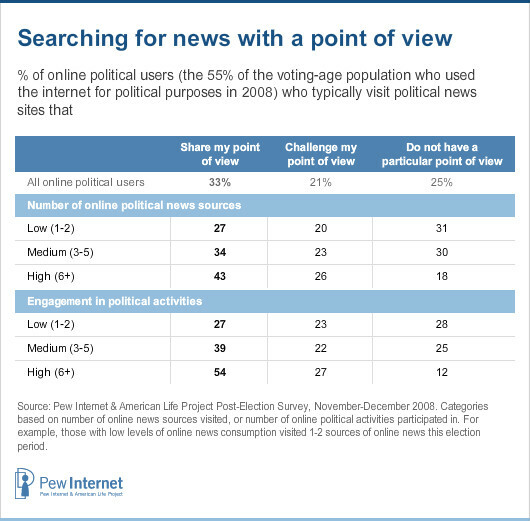 At the close of both the 2004 and 2008 elections we asked those who seek out online news whether they typically visit online news and information sites with a particular partisan “slant.” In 2004, 32% said that they usually go to sites that don’t have a particular point of view, while 26% said that they go to sites that share their own point of view and 21% said they went to sites that challenge their point of view. This increase is driven in large part by partisans on both sides of the political spectrum. The percentage of Republicans who say they usually visit sites that share their point of view has grown from 26% in 2004 to 35% in 2008, while the percentage of Democrats who say this has grown from 34% to 44% over the same period of time. Responses among political independents to this question were nearly unchanged between 2004 (19%) and 2008 (22%). However, the most notable change occurred among the youngest cohort of online news consumers. The percentage of online political users age 18-24 who typically seek out sites that share their point of view has grown from just 22% in 2004 to 43% in 2008, a nineteen percentage point increase. As online political users take part more intensively in the online political process, or delve more deeply into the long tail on online political news content, they increasingly seek out sites with an overtly partisan point of view at the expense of sites that profess to be neutral. For instance, those who visit a wide range of online news sources are far more likely than those who visit a narrow range of news sources to say that they generally visit sites that share their point of view, and slightly more likely to visit sites that challenge their point of view. By contrast, less intense online news consumers are much more likely to look for news that is unbiased or does not have a political point of view. While the presidential campaign was at the center of the online action, other races were popular as well. Online political users expressed a greater interest in all aspects of the election this year, as a significantly greater percentage of online political users went online to get information about each of the different races this year compared with 2004. This includes a ten percentage point increase in the number of online political users going online for information about ballot measures and races for US House and Senate, as well as a thirteen percentage point increase in the use of the internet for information about local ballot measures and initiatives.